LeRoy Percy was an attorney, planter and politician in Mississippi. 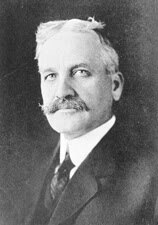 In 1910 he was elected to the United States Senate, serving until 1913. Percy had attended the University of Virginia, where he was a member of the Chi Phi Fraternity. He achieved wealth as an attorney. Often being paid in land, he became a major planter in Greenville, Mississippi, in the heart of the Delta. His plantation of Trail Lake eventually covered 20,000 acres and was worked by African-American sharecroppers. He also leased land in the Arkansas Delta. That plantation recruited Italian immigrants as sharecroppers. In 1907 conditions were investigated by the US Department of Justice, due to Italian complaints to their consulate. The investigator found it constituted peonage, but Percy's political influence led to the report being buried and neither he nor his overseers were prosecuted. Due to his influence, Percy became active in politics; he was elected by the Mississippi state legislature to the U.S. Senate, serving from 1910 to 1913. He was defeated in 1912 by a populist Democrat in the first popular election of US Senators.